As I predicted two weeks ago, I spent the first half of tonight’s Super Bowl game photographing Pittsburgh Steelers and Green Bay Packers fans in two different sports bars. Here are a few photos; check out some more at the York Dispatch‘s site. © 2011 by The York Dispatch. 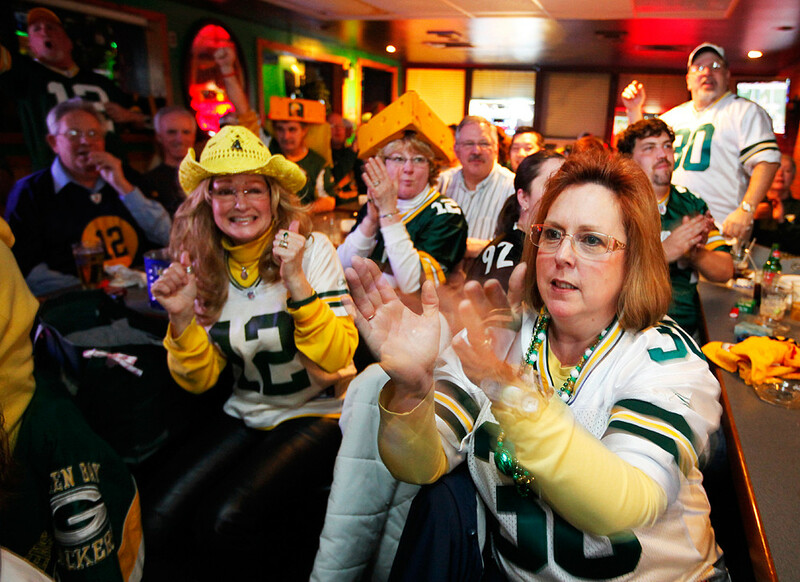 Green Bay Packers fan Teresa Filipelli (foreground), of Dover, cheers at Jamie's Courtside Sports bar after the Packers got two consecutive first downs in their third drive of the first quarter of the Super Bowl game on Sunday, Feb. 6, 2011. The Packers fan club gathered at Jamie's to watch their team take on the Pittsburgh Steelers in the 45th Super Bowl game. © 2011 by The York Dispatch. 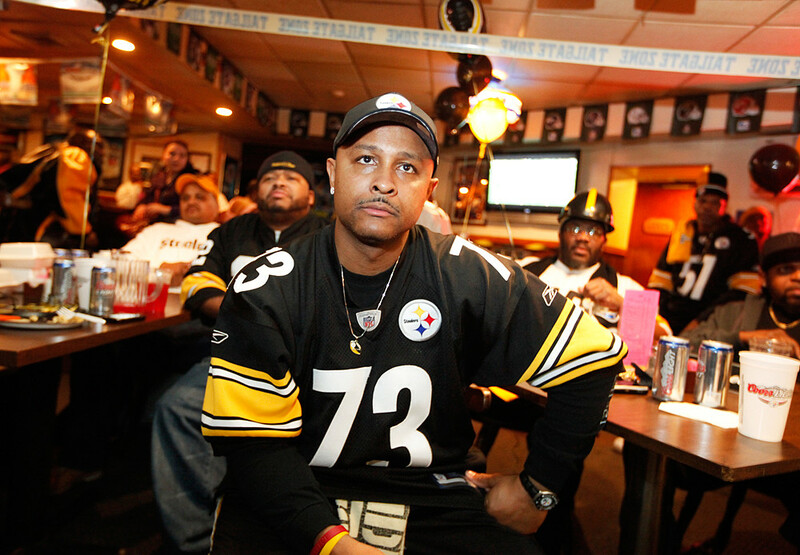 Pittsburgh Steelers fan Bob Roland, of York City, intently watches the Super Bowl game at Stockade Tavern on Sunday, Feb. 6, 2011. Roland said he has been a Steelers fan since the 70s, and proudly sported a Steelers watch and necklace. © 2011 by The York Dispatch. 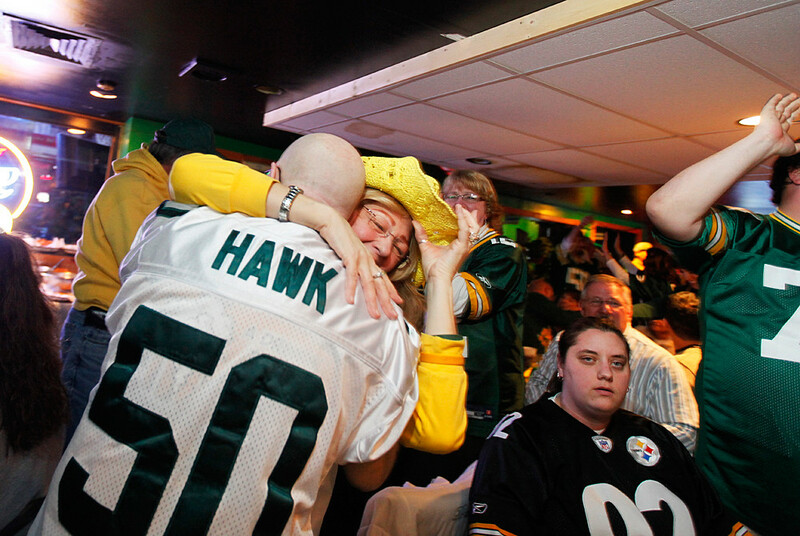 Alan Brown of West Manchester Township and Jeanne Behnke of Manchester hug in celebration of the Green Bay Packers' first touchdown in the 45th Super Bowl, as Pittsburgh Steelers fan Mary Krause of Dover remains seated in Jamie's Courtside Sports bar on Sunday, Feb. 6, 2011. Behnke is the Packers' local fan club organizer. Despite her being a Steelers fan, Krause sat among the club's members, as she is a friend of many of them. © 2011 by The York Dispatch. Ralph Preston, Jr., (center right) raves to Bob Roland, Ray Brown, Louis Calhoun and Samuel Layer, all of York City, that the Pittsburgh Steelers need to score a touchdown before the Super Bowl's halftime in order to gain any momentum in the game. 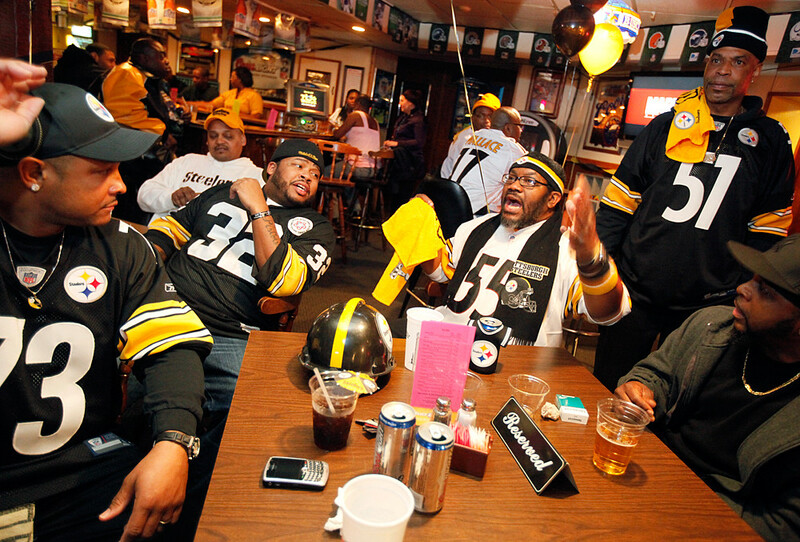 A small crowd of Steelers fans gathered at Stockade Tavern on Sunday, Feb. 6, 2011, for a Super Bowl watch party. Shortly after Preston's rant, the Steelers scored their first touchdown - before the game's half. © 2011 by The York Dispatch. Joe Powers, of Springettsbury Township, relishes the Green Bay Packers' first touchdown in the Super Bowl game against the Pittsburgh Steelers on Sunday, Feb. 6, 2011. 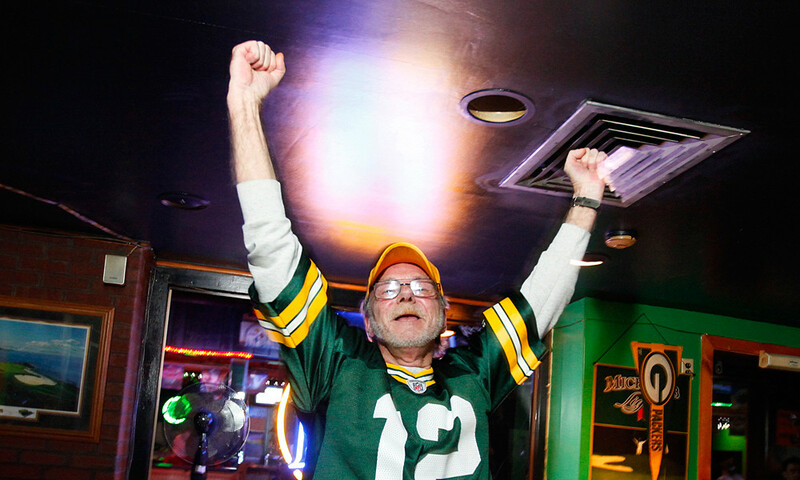 Powers was one of several dozen Packers fans who gathered in Jamie's Courtside Sports bar to watch the game.